"My kids started taking their first piano lessons with Stephanie and we had no idea what to expect. She far exceeded our expectations. Immediately she figured out how to motivate each of our children such that they looked forward to lessons every week and practiced voluntarily. She is patient and kind with kids yet inspirational. As a parent, she is easy to interact with, very professional and reasonable. At the end of the year, she hosted a recital that was so impressive. She had kids of all levels performing to their best. It was a testament to her dedication as a teacher to be able to get this many kids 'performance ready’. She really is a gift to piano students!" Stephanie is the best teacher I ever had. She is flexible with my family's schedule and can adjust to different times for lessons. I love the way she teaches. It is both fun and educational. Stephanie is familiar with various types of piano books. She is the greatest teacher ever! "Stephanie is a gifted musician and teacher and, despite her soft-spoken manner, has high expectations for her students. My daughter thrived under Stephanie's guidance, growing in her skill, confidence, and enjoyment of piano playing. I was very impressed with Stephanie's students' performances at the recitals, and very pleased with my daughter's musical progress. 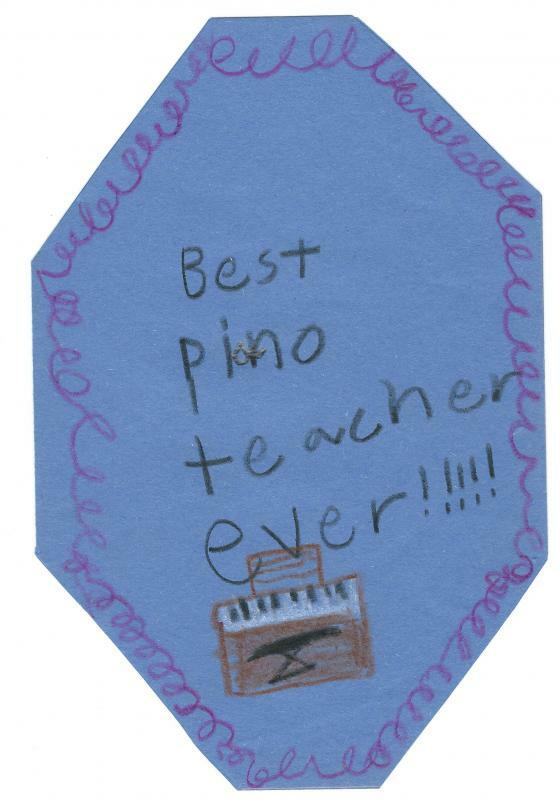 Most of all, I appreciated her teaching style, which was both low-key and tailored to meet the needs of the child, rather than a cookie cutter "one size fits all" approach favored by other piano teachers. In addition to her talent and competence as a musician and teacher, another great advantage to lesson with Stephanie is that she will come to your house! I was able to make dinner and take care of other chores while listening the the piano lesson in the other room! I would highly recommend Stephanie to any child or adult who is interested in pursuing piano study at any level. She is uniquely suited to teaching piano in a low-stress, yet productive and educational way, and I can't imagine anyone who could do a better job. " "Our three children, ages 14, 13 and 11, began lessons with Stephanie two years ago after having taken lessons since they were each six years old. We considered them fairly accomplished pianists. However, when they began lessons with Stephanie we witnessed a rapid and dramatic improvement of skills in each child. Her focus on classical music and emphasis on proper technique took their loose skills that they had developed over the years and elevated their level of playing substantially. They began to master more difficult and interesting pieces of music, developed better use of dynamics and honed their technique. The improvements of technique, more fluid note reading and understanding of classical piano has allowed them to more easily and independently play their favorite contemporary music and has augmented their skills with other musical instruments. The kids have gained more confidence in their playing, are excited about their own abilities and frequently just sit down to play for fun. They are now enjoying the results of their hard work and their excellent instruction!" "Stephanie is always on time and fits my family's busy schedule. She's organized with various piano books and is willing to listen to my suggestions. The rewards I get for practicing are the recitals, which makes me practice even more! 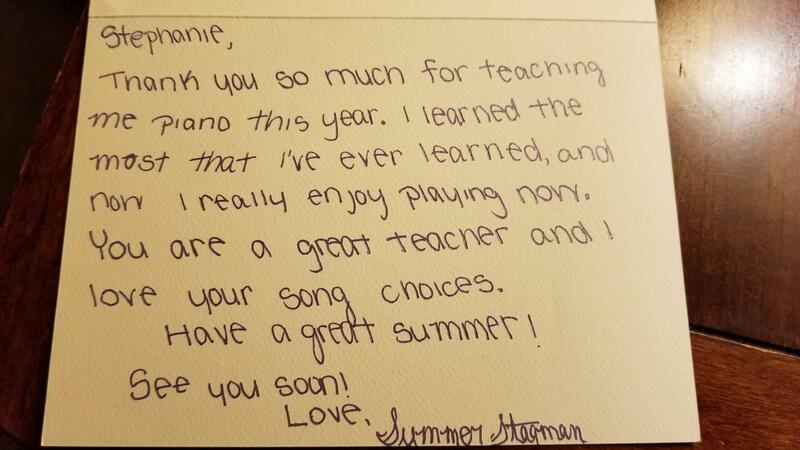 Stephanie is by far the best piano teacher and I highly recommend her!" "Stephanie came to our home to give my son weekly piano lessons for two years, and the improvement in his playing has been remarkable. She is very serious about technique and building a classical repertoire, but she understands kids, and is also flexible about letting them learn more popular tunes, if that is what will keep them interested and practicing. We have great respect for her as a teacher, and also enjoyed getting to know her personally. I would highly recommend her to anyone who is interested in learning piano." "Our entire family was able to advance quickly through lessons with Stephanie. Our four year-old girl learned her notes & simple songs, and our seven year-old boy mastered some beautiful études. My husband was completely new to learning any musical instrument, and can now play many classical pieces & Christmas songs that he has always wanted to, after only about 10 lessons." 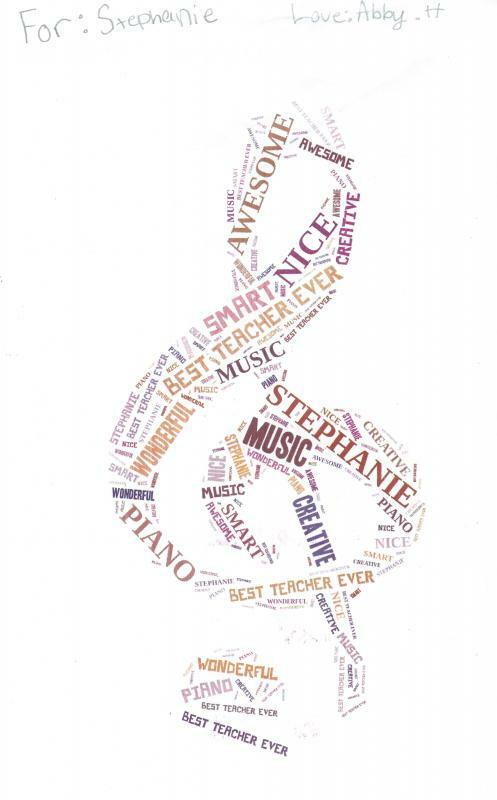 Ms. Stephanie has been our kids piano teacher for about 6 years. We like her teaching style and most of all we love how our boys playing piano style have improved and they learn to feel music and most of all to read music. Stephanie is kind, professional, flexible and responsible. We would 100% recommend her as piano music teacher. 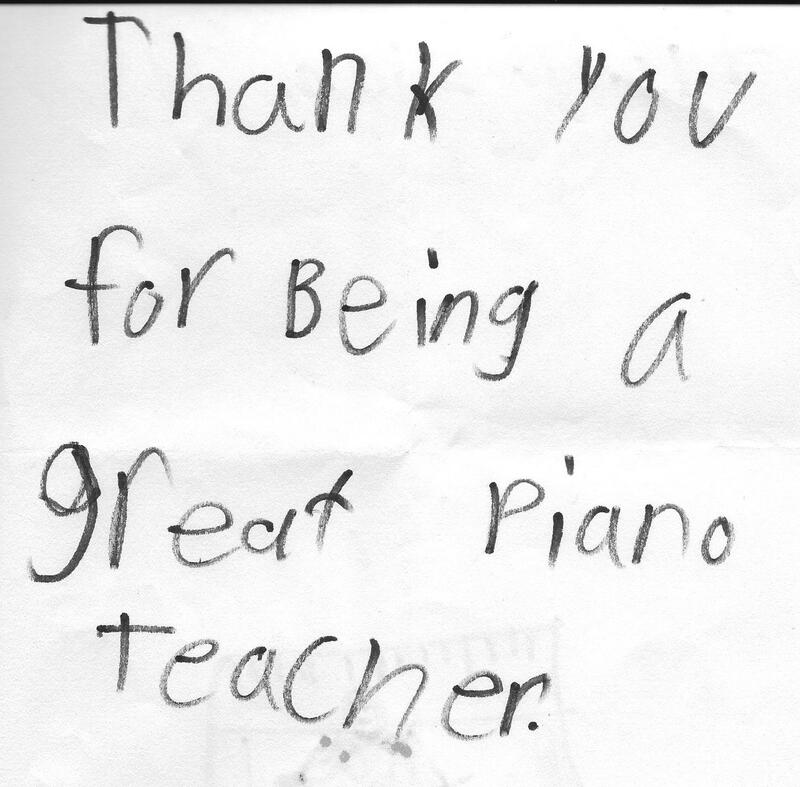 "Stephanie has been teaching my family the fundamentals of piano for three years. Her attention to detail, emphasis on technique and music theory, is evident in our piano playing. She is committed and passionate about her craft and looks for students who share her love for piano."